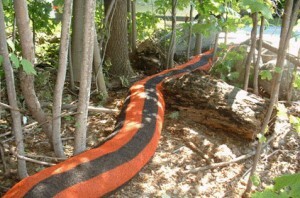 Filter sock is the current Best Management Practices (BMP) for the control of sediment around natural gas well pad sites, pipelines, roadways, construction sites and other disturbed areas. Evergreen Environmental uses a variety of filter sock sizes and materials to comply with specific site specifications and regulations, from 8” to 32” in diameter. Socks are either placed individually or stacked, according to customer requirements and site conditions. Whatever the application, we have the solution.